rideTYRANT.com: 2 days, Tons of Riding! So this weekend was pretty nuts...and it's not over yet! 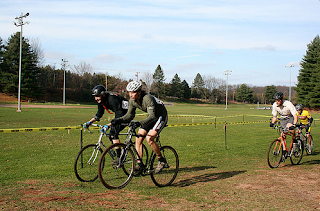 T and I headed out to watch the CT State Cyclocross Championships yesterday in Cheshire. We had a small crew to cheer on Matt and Doug of Team Ghostship giving 'em hell in the single speed race. The guys rode well on a somewhat muddy course and Matt took the Holeshot Award winning a lovely 24 oz. brew. Matt also deserved the Best Dressed award in his usual black shirt and red tie. Yesterday night, we headed to Haven to snap some photos and hang out with regular crowd. It was nice to see Matty Still and Stan down from Mass. once again...they're becoming regulars at the park. Tiny TYRANT was going off throwing down some mean ice picks, hop whips, and boosting in the bowl. Everybody was having fun and the session was pretty low key. With it being 60 out yesterday I hope everyone got out to enjoy the sunshine and ride! 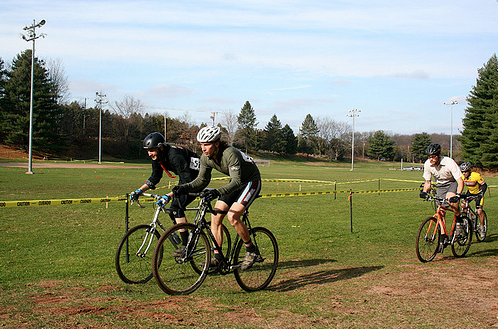 I'm off to the cyclocross race at the Durham Fair Grounds this morning...no sleep for the wicked! Matt gunning for the holeshot!